England began their Six Nations campaign with a 9-15 victory over their oldest rivals Scotland at Edinburgh’s Murrayfield Stadium on Saturday. The result is England’s fourth straight win at Murrayfield and extends their unbeaten run over Scotland to nine matches. Eddie Jones’ tenure as England coach has started in same way that Stuart Lancaster. Scotland have not scored a try against England at Murrayfield since 2004 when Simon Danielli crossed the whitewash. It was not exactly a flying start to a new era for Jones and his team but, after the ignominy of England becoming the first host nation to exit a World Cup before the knock-out stages, a sixth successive Calcutta Cup victory against Scotland qualified as a solid first step. For the Scots, having come within a whisker of reaching the last four at the World Cup, the result and the performance came as a disappointment. Their Kiwi head coach Vern Cotter is still waiting for his first win in the Six Nations, Scotland having suffered a whitewash in his maiden season last year. Equally depressingly, the Scots drew a sixth successive Murrayfield blank on the try scoring front against England. Not since a Simon Danielli score back in 2004 have they crossed the England whitewash at Murrayfield. 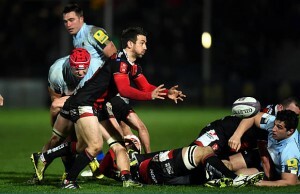 All they managed on Saturday were three penalties by their captain Greig Laidlaw. “It’s a really well done job. We’ve won the Calcutta Cup,” Jones told the BBC. New England skipper Dylan Hartley admitted it wasn’t the most stylish of displays. Cotter insisted his team did not show their true side in the game. “The players are very disappointed. I thought we created opportunities and didn’t finish them,” said Cotter. England were on the front foot from the off, spending the opening stages deep in home territory. 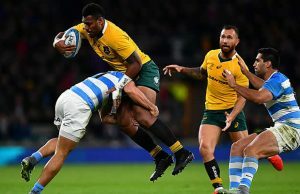 The Scottish defence held firm, though, and they breathed a sigh of relief when England fly-half George Ford pushed wide a drop goal attempt in the tenth minute. It proved to be a temporary reprieve. English pressure told in the 14th minute, Harlequins lock Kruis barging through three defenders to score his first international try from an attacking scrum. Owen Farrell added the conversion to furnish England with a 7-0 lead but Laidlaw nailed his first penalty attempt to peg the gap to 7-3 in the 17th minute. Laidlaw had a chance to cut the deficit to a single point in the 29th minute when Ford was penalised for not releasing in the tackle but this time the scrum-half pulled his kick wide of the posts. The Scots might even have led at half-time but, after fine work by flanker John Hardie, fly-half Finn Russell was off the mark with a drop goal attempt. As it was, England turned round with a 7-6 advantage. They had to withstand some early pressure after the interval but steadily asserted their authority. Farrell missed a penalty attempt but in the 51st minute the inside centre fed Nowell into the right corner for England’s second try -– thanks to a deft pass from replacement prop Mako Vunipola. It was the Exeter wing’s eighth try in eleven matches for England. Farrell was off the mark with the conversion but England led 12-6. Farrell stretched the lead to 15-6 with his first penalty success in the 63rd minute. Laidlaw reduced the gap with a penalty in the 69th minute but that was scant consolation for the Scots, who blooded 20-year-old Glasgow prop Zander Fagerson as 69th minute replacement -– their youngest prop since Bill Black in 1948. Scotland face Wales next in Cardiff on Saturday, February 13. England, who gave a debut off the bench to Harlequins back rower Jack Clifford, face Italy in Rome a day later. Billy Vunipola was named Six Nations man of the match. Stuart Hogg; Sean Maitland, Mark Bennett, Matt Scott, Tommy Seymour; Finn Russell, Greig Laidlaw (capt); David Denton, John Hardie, John Barclay, Jonny Gray, Richie Gray, Willem Nel, Ross Ford, Alasdair Dickinson. Replacements: Stuart McInally, Gordon Reid, Zander Fagerson, Tim Swinson, Blair Cowan, Sam Hidalgo-Clyne, Duncan Weir, Duncan Taylor. Mike Brown; Anthony Watson, Jonathan Joseph, Owen Farrell, Jack Nowell; George Ford, Danny Care; Billy Vunipola, James Haskell, Chris Robshaw, George Kruis, Joe Launchbury, Dan Cole, Dylan Hartley (capt), Joe Marler. Replacements: Jamie George, Mako Vunipola, Paul Hill, Courtney Lawes, Jack Clifford, Ben Youngs, Alex Goode, Ollie Devoto.